Another Friday. This week flew by for me - I think it was because students are back and I am busier than I've been since May. I kind of love it. But, it does make social media life harder. Is getting answers to twitter questions hours after you've asked them annoying? If so, sorry, but only a little. 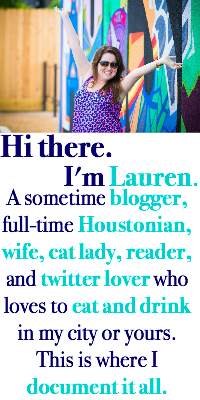 It's pretty much guaranteed that if you ask about food or TV, I will answer (PS - I am following a lot of new blogs lately, but maybe not your twitter - find me @lauren1031 and let's follow each other). And now.... on to the five! 1) Making Thursday the new Friday. Can we do that? I mean, I will still come to work on Friday if I have to, but I really like going out on Thursday nights as I have the past few. Sara and I met up at Anvil for yummy cocktails and their pretzel with cheese that I pretty much wanted to bathe in. I think after two hangouts, I can pretty much think of her as "my friend Sara" and not "my blog friend Sara." Right? Thursday plans make the week go faster. What's happening next week? Cute stationery! Bloggers don't use notebook paper, obviously! 3) If you're in Houston and need unique catering, call Grizzaffi Coffee. I catered an event with gelato and yummy lattes made on site yesterday and my coworkers were SO SO happy with it. The couple that owns it were as nice as could be and I really want to work with them again. They do the coffee at Discovery Green in the winter, too. They have no idea I am saying this but my experience with them was that good that I wanted to share. Plus, it went over really well as an employee incentive to look into for your area if you're not in Texas (this company will travel within the state!). 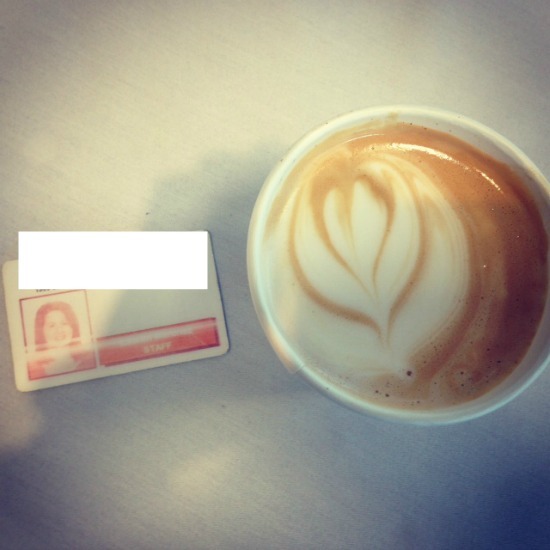 I love latte art, even if it did get off-centered because I was talking the poor woman's ear off! 4) I am working on an event in which we need a celebrity host. For some reason at a meeting yesterday, Kyle Chandler's (AKA Coach Taylor from Friday Night Lights) name was thrown in as a possibility and for about literally three seconds I thought he was coming to host the event and fangirled at a table of real adults. Most of whom did not know who that was. I'm pretty sure he's not coming, but if he does, I'll let you know. Oh, and does anyone have a connection to any national celebrities? 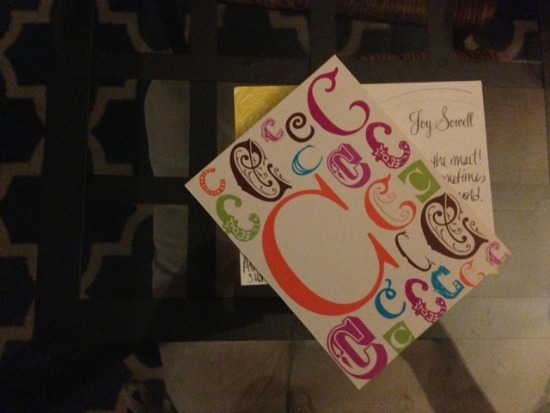 5) Still excited that I am attending Blog Elevated (see how here) and now I need to design business cards. Eek! I am not good at making things pretty so that will be pretty tough but I'm going to try this weekend. Any tips? This weekend is promising to be good. Hope yours is, too! Linking up with Lauren and these ladies! Well since we both decided to the world we are "real friends", we are def real friends!! But, I never watched Friday Night Lights...so actually are we still friends?!? Ok, what a small world - my co-worker's brother owns Grizzaffi's coffee! The entire Grizzaffi family are entrepreneurs it seems like. I need to try that latte!!! OMG! How did this week fly by so fast?! Our students moved in yesterday and I just don't think I'm ready for the semester! LOL ... I was just thinking to myself "didn't I just see those same drinks and food on another blog?!?!" and duh. It was Sara. Coming by from the link up, have a great weekend! I love going out on Thursdays! I call it my Lil' Friday. 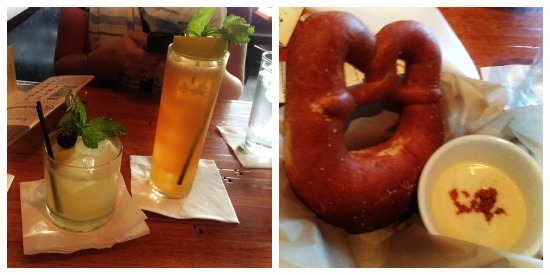 That pretzel looks divine! :) Stopping by from High Five for Friday link up. Come and visit - having a $200 J.Crew gift card giveaway! Ends tonight!